ConnectPV High Capacity Input (HCI) Disconnect Combiners are based on the same high quality product architecture as the standard 1500V Disconnect Combiners with the integration of larger 40A and 50A input fuses in touch safe fuse holders. These higher capacity combiner inputs support more strings per fuse, enabling a single combiner input per tracker, reducing home run wires to the combiners to 2 wires per tracker. 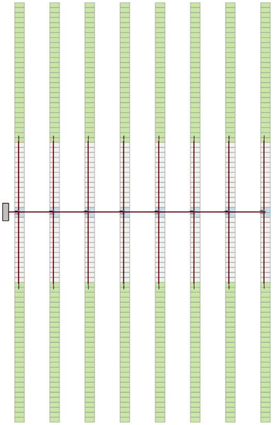 Referencing Image 1 below – a typical single-axis tracker application uses ConnectPV’s UL9703 Certified 1500V 3-string Overmolded Wire Harnesseses (Crystalline Modules), 1 per SAT, coupled with a single pair of 8 AWG (10mm2) Home Runs to a 50A fuse in the combiner – (8) harnesses, (8) home run pairs, and (1) 400A combiner per subarray (some modules may allow up to 9x 50A inputs per 400A combiner).